A statue commemorates Ignác Semmelweis, described as the "Saviour of Mothers", at the Szent Rókus Hospital in Budapest. Erected in 1904, the statue is the work of sculptor Alajos Stróbl. Hungarian Minister of Human Capacities, Dr Miklós Kásler, has added his voice to those honouring physician Ignác Semmelweis this year, in his article just published in “Polgári Szemle”, a social science journal. 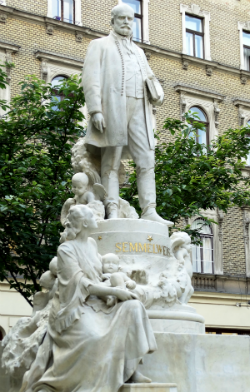 Dr Kásler is the latest of many national and international public health figures to pay tribute to the work of the Hungarian physician and humanitarian Semmelweis, who is credited with saving more lives than any other physician in history. Semmelweis’ legacy includes introducing handwashing protocols for medical procedures, particularly in dealing with women in labour. While contentious and unpopular at a time when the presence and transfer of bacteria was not known or understood, his discoveries and persistent efforts to bring about change led to a new paradigm in infection control, and are just as relevant today as they were in the 1840s. This year marks Semmelweis’ 200th birth anniversary, in commemoration of which 2018 has been designated the Ignác Semmelweis Memorial Year in Hungary. The article was released to coincide with the opening ceremony of the Ignác Semmelweis Memorial Year held on 5 June 2018, hosted by the President of Hungary János Áder in collaboration with the Hungarian Academy of Sciences and Semmelweis University in Budapest, and attended by Dr Zsuzsanna Jakab, WHO Regional Director for Europe.